The Alpha range by Nielsen exudes elegance from every angle. Designed to meet the exacting quality requirements of independent frameshops and their customers, Alpha has the design and integrity of a custom framing solution. 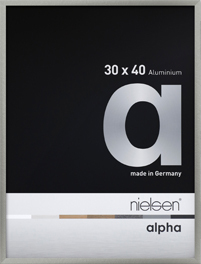 The Alpha range by Nielsen exudes sophisticated style from every angle. Designed to meet the exacting quality requirements of independent frameshops and their customers, Alpha has the design, style and integrity of a custom framing solution. Available in 13 colours, 32 sizes, 13 finishes, 9 anodised and 4 real wood veneers. A picture frame without equal.